Every year around Halloween, a lot of people like to make scary Halloween videos and then upload to the Internet for sharing. Searching online, you can easily find scary Halloween videos to share with your friends. If you want to download Halloween scary videos and just don’t know how, this is the right place for you. To download scary Halloween video from YouTube, a good video downloader is in order. It should be easy to operate, and have a fairly reasonable price, but what is more important is that it can download scary Halloween video from YouTube at high speed and save you from waiting. Leawo Video Downloader is able to download scary Halloween videos from YouTube, and other online videos form different online video sharing websites like YouTube, Facebook, MySpace, iFilm, Myspace, Dailymotion, etc. Leawo Video Downloader helps you to manage downloaded videos easily. You can sort them by name, time, size or length. With an online video accelerator, Leawo Video Downloader could download online videos with high speed and significantly save your time from waiting for the download to finish. With Leawo Video Downloader, people could easily download videos from online video sharing webistes and transfer them to their portable devices and watch the videos on the go. With the built-in video accelerator, Leawo YouTube Downloader could also speed up online video loading. 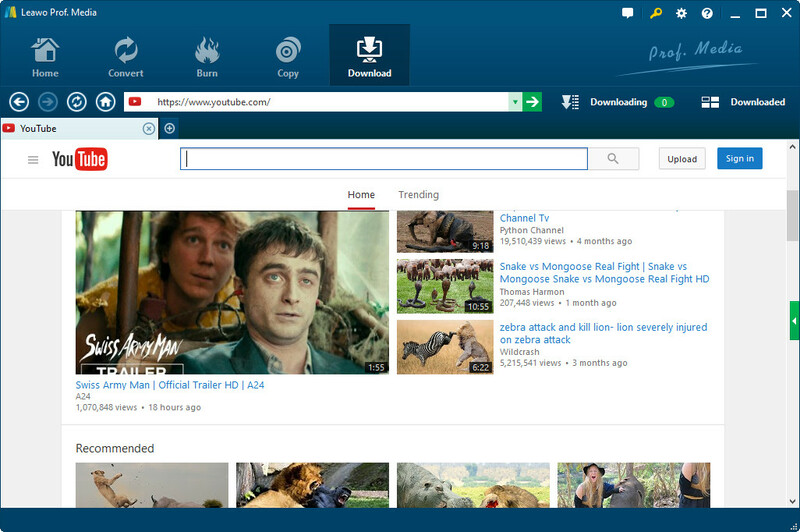 Online video playback with the built-in browser is fast and smooth. With the help of Leawo Video Downloader, Halloween scary video downloading is like a piece of cake. Just download the program and have it help you download all the Halloween scary videos you want! The instructions below will show you how to download scary Halloween videos from YouTube with Leawo Video Downloader. To add YouTube videos to the downloading list, paste video URL in the address box. You can watch it directly with the built-in browser. The video you are watching will be detected directly. A professional video downloader would be the best choice to download scary Halloween videos as it’s easy and convenient. But if you don’t want to install a new program to download scary Halloween videos, there’are other options out there. There’s this kind of website that can help you download scary Halloween videos from online video sharing websites like YouTube, Facebook and DailyMotion, etc. This kind of website can help you download the video with the browser on your computer and no software installation is required. Here I would show you how to download scary Halloween videos from YouTube using this kind of online video downloading websites. Let’s take onlinevideoconverter.com as an example to show you how to download Halloween scary videos. Step 2: Copy the link with the scary Halloween video clips you want to download and paste the video link in the link box. This online video downloader provides you with the option to choose the video format you want. Click the Format box and choose the ideal format as the default output format. Click More Settings to choose the ideal quality of the video. When you are done with the above steps, click Start button and the website would start analyzing the link and prepare the scary Halloween videos for you. Step 3: After a while it would open the download page of the video. Now click the Download button to download the Halloween scary videos. This kind of online video downloader is convenient in a way. For instance, you don’t have to install a new app just to download some videos from YouTube. But if you download all kinds of videos on YouTube all the time instead of just scary Halloween video clips, a professional piece of software is no doubt the better choice for you. A online video downloading program is more reliable, stable and efficient. With Leawo Video Downloader you can manage the downloaded videos easily. If you’ve downloaded a lot of stuff with your browser, the video you download would be stored with other files and it makes managing them hard. All in all, a professional online video downloader like Leawo Video Downloader would be a much better choice.